Whether you need lifesaving care for a heart attack or stroke, ongoing care for a condition such as coronary artery disease, heart failure or high blood pressure, you can get complete heart and vascular care at University of Maryland Capital Region Health. In addition, our heart surgery team partners with University of Maryland Medical Center to offer the highest level of care in Prince George’s County. That means you’ll receive care from heart care professionals who are trained at one of the nation’s best cardiac surgery programs. The University of Maryland heart surgeons care for more heart surgery patients than any other program in Maryland. Our quality earned us special accreditation by the Society of Cardiovascular Patient Care as a Chest Pain Center with Percutaneous Coronary Intervention (PCI) for our heart attack care. Our cardiac surgery program has been ranked among the top 10 percent of programs nationally. 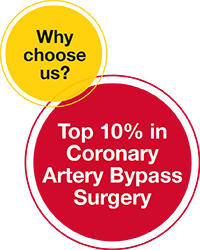 The Society of Thoracic Surgeons recognized us for exceptional clinical performance for coronary artery bypass surgery for analysis of data covering reporting periods from January 1, 2015 through June 30, 2016. We received Primary Stroke Center certification from The Joint Commission for our stroke care expertise. Arrhythmia care: Our electrophysiologists (doctors who specialize in arrhythmias) diagnose and treat heart-rhythm disorders using the latest techniques. Heart surgery: We offer leading-edge care from an expertly trained heart surgery team. Lifesaving heart attack care: We provide prompt, expert care to minimize the effects of a heart attack. Stroke care: Our stroke care team specializes in diagnosing and treating strokes, when every second counts. Vascular care: We offer the latest treatments for diseases that affect the blood vessels, including minimally invasive and limb-saving techniques. Minimally invasive treatment: We offer advanced treatments for heart and vascular disease that don’t require surgery. Recovery and cardiac rehabilitation: We combine exercise, education and support to help you lower heart disease risk and lead a heart-healthy life. Our vascular experts treat everything from spider and varicose veins to complex surgeries, to prevent strokes, heart attacks and more. Our surgeons work with cardiologists (heart doctors), imaging specialists and other care team members to evaluate your condition and plan your treatment. Advanced, limb-saving techniques: We offer expertise in both open and minimally invasive surgery to repair damaged blood vessels, clear blockages, and restore blood flow. Our surgeons can perform complex surgeries to re-route blood flow around blocked areas (bypass surgery) to prevent the need for amputation. Dialysis access: When your kidneys don’t work properly, dialysis performs the function of the kidneys using a machine. Your blood is circulated through the machine to clear out waste and excess fluid, then returned to your body. Vascular surgeons make a surgically created vein where your blood is removed and returned during dialysis. Minimally invasive procedures: Our endovascular surgeons use catheter-based techniques — such as angioplasty and stent placement — to repair damaged vessels or remove plaque (a fatty substance). Surgeons use these procedures to prevent and treat heart attacks, strokes, peripheral artery disease (PAD) and other vascular diseases. Thrombolysis: Our vascular experts use special medicines (also called thrombolytic therapy) to dissolve blood clots, including emergency treatment for clots that block blood supply to the brain, heart and lungs. Venous disease treatment: We offer the latest treatments to manage conditions that affect the blood vessels in your legs, such as deep vein thrombosis (DVT), leg pain due to plaque buildup (claudication), spider and varicose veins, and more. Wound care expertise: Wounds need proper blood supply to heal properly. Vascular surgeons use a variety of techniques to improve circulation and speed healing, which can prevent infection and prevent limb loss. Vascular specialists work closely with your care team to provide you with comprehensive care.